I hope very much that you have had a great start to the year – and are enjoying the lighter evenings as we head into the Spring. We’ve had a busy start to the year, with decisions on priorities for the next 18 months and ensuring that we have the resources in place to deliver on that programme. You may well have read in the local press that many towns in Wiltshire have chosen to increase their small portion of Council Tax, known as the Parish Precept. Apart from a small amount of income from St Margaret’s Hall, the Precept is the only real means of funding that the Town Council receives, and there are increasing calls upon it. 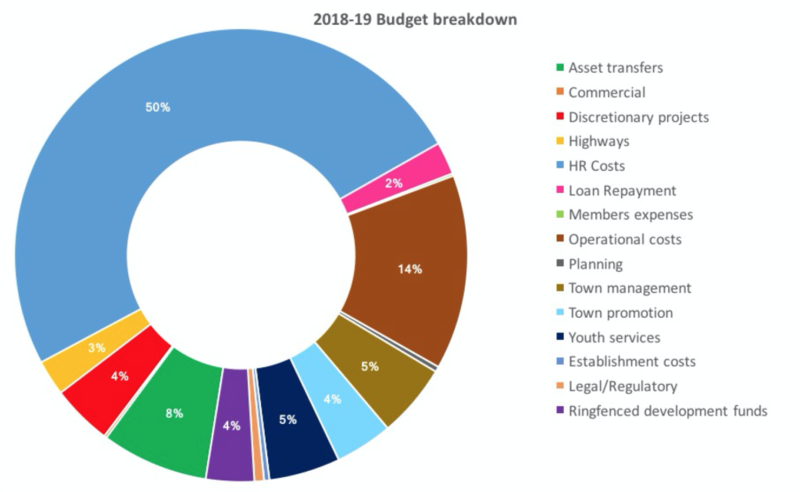 As a Town Council, we began to discuss the budget for 2018-19 in November, with meetings through December and January before I proposed the final budget figures to a full Town Council meeting in mid-January. It was a robust process, with challenges from all sides to ensure that we focussed on the right areas and to balance the needs to improve and expand services that you look to us to provide, with containing the impact on each household’s finances. This process saw us revise down an initial potential increase of £1.20 per house per week, a smaller increase of around £0.65 per house per week for a Band D property – this is line with commitments before the election to increase the rigour around financial decisions, but also to be an active Town Council and deliver improvements to services. A key priority for next year will be taking on and developing places and spaces in the town. Last year, we were asked by Wiltshire Council to contribute to the maintenance of Barton Farm play area on a ‘fund it or lose it’ basis, and a similar line has been on Poulton Skate Park. Rather than continue to subsidise through the ‘back door’, we have set aside a specific funds to prepare for the transfer of those assets and services, starting with Culver Close, and including the sports facilities and Barton Farm Play area. Wiltshire Council policy is now focussed on transferring ‘services’ rather than ‘assets’ and Councillors will be meeting in the near future to finalise our strategy for that negotiation – top of our list will be our play areas, to make sure that children in the town have safe and well-maintained places to enjoy. We’ve assigned £60,000 to this work, and will be seeking your views on how that money can best spent on improvements in the coming year, potentially including equipment for adult fitness as well as play equipment for children and young people. Back in December, the Council agreed a Youth Strategy which will see Bradford reinstate a youth service in the town by commissioning a service provider. We are also hoping, through additional money from the Area Board/Local Youth Network, to extend this into the surrounding villages. The aim of the strategy is to build for the future of the town, recognising the role that young people can play as active citizens, and giving them the opportunity to take part in society. There will also be a preventative element, to identify and work with young people deemed to be at risk of anti-social or criminal behaviour, to try and address issues before they emerge. We’ve assigned £40,000 to this project, which will also be supported by the Colonel William Llewelyn Palmer Educational Charity and a private donation. We will also be starting work imminently on the second part of the strategy, which will hopefully see us set up as trust to build and maintain leasehold properties in the town, specifically aimed at young people who have left home. As part of this, we’ll also be talking to local business to discuss the possibility of apprenticeship schemes, so that there is a real prospect of young people born in the town actually being able to live and work here once they leave school. One of the reforms we brought in after May was a new ‘grants’ process, whereby any individual could bring forward a proposal seeking funding or support from the Town Council. As an extension to this, we have chosen to create a pot of £35,000 for use on discretionary projects. This year, we have supported specific projects to take on disused telephone boxes for use as community resources, and we’re also funding a community fridge start-up, alongside other funding for health and well-being and sports services, and projects protecting victims of domestic violence. If you have a great idea that will serve the community, please get in touch with the office, and they will help you get started. We’re also investing more than £25,000 in ‘development funds’ which will support a new Tourism Strategy, help us towards a greater role for the town in spending decisions through research into participatory or ‘people’s’ budgeting, and provide greater support to the many wonderful volunteers who work across our community groups. The Town Council has been a signatory of the 2050 Carbon Neutral pledge for a number of years, but this year we’re taking some real action to help us get there. We’ve committed £10,000 to support eco-projects in the town, and are exploring the possibility of the Town Council itself moving to a fully green energy supplier. We’ve also identified air quality as a key factor in addressing the long-standing issue of traffic in the town, and are aiming to rebalance the use of the towns roads to promote the health and well-being of residents, and protect the economic viability of the town centre – on the basis that a healthy, less-polluted town that’s safer for pedestrians is more likely to thrive. We’ve committed £20,000 to support that policy, and will continue to seek to work with Wiltshire Council as the Highways authority to promote it. Alongside new projects and extended services, we are also investing in our people – we need more hands at the Town Council to run all of this effectively. We will be making a small investment in additional staff, including an Operations Manager to manage services and contracts, and an IT manager – this recognises that new regulations coming in May will require additional resource to make sure that the Town Council is fit for a digital age in terms of keeping your information and communications safe and secure. We understand that this is an increase in household costs for most people – but we also feel that this is a progressive budget that will provide real value to the town, and which places the town’s well-being front and centre in our thinking – for now and in the future.